Information on volunteers needed for upcoming 28Jan17, 4Feb17 and 11Feb17 events is below. Are you looking for a way to share your skills, talents, passion having fun and positively impact the lives of students age 6-18 in our community? It doesn’t matter which FIRST program you volunteer for, you will always walk away at the end of the day with a sense of pride and fulfillment, knowing that you have helped children experience what they never might have without FIRST and without your support. 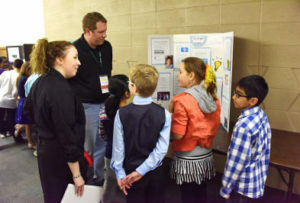 300+ volunteers are currently being sought to support 15 upcoming FIRST (For Inspiration and Recognition of Science and Technology) competitions and events in it’s 8th year in the Quad City area reaching ~1,500 students. 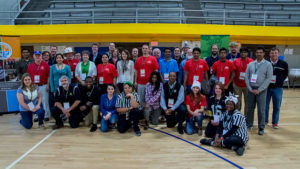 No previous experience or technical background is required for many of the volunteer positions with adults and college and high school students eligible to volunteer. Volunteers will be provided food, beverages, and an amazing experience supporting our local youth! Create an account if it’s your first time, which includes providing contact information, info “About You” with all info except Military Service having “Prefer Not to Answer” as an option and your expertise.If you have previously volunteered, you can log-in and don’t need to create an account. Find and apply to volunteer at one or more FIRST Events including the ones listed above. You can prioritize the positions you are interested in supporting. You can search for events by program and/or location including zipcode and distance in miles. Note: In order be assigned to a volunteer position, you will need to pass the background check (can take one week or more) initially the first time you create an account and apply as part of FIRST’s new Youth Protection Program. Note: you are not required to provide your social security number and there is no cost for the background check to you. The background check is done the first time you apply and there after every three years. You will receive an e-mail when you have been assigned to a role. 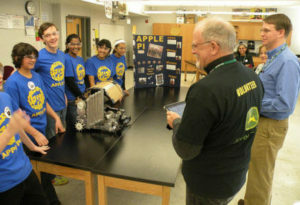 FIRST was founded in 1989 by Dean Kamen (inventor of the Segway) with their mission to inspire young people to be science and technology leaders, by engaging them in exciting mentor-based programs that is much #MoreThanRobots by building science, engineering and technology skills, that inspire innovation, and that foster well-rounded life capabilities including self-confidence, communication, and leadership. 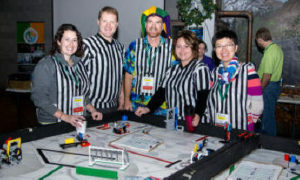 No previous experience or technical background is required for many of the volunteer positions including some of the judging roles & refereeing with training available. Positions are available for adults and students in college & high school.